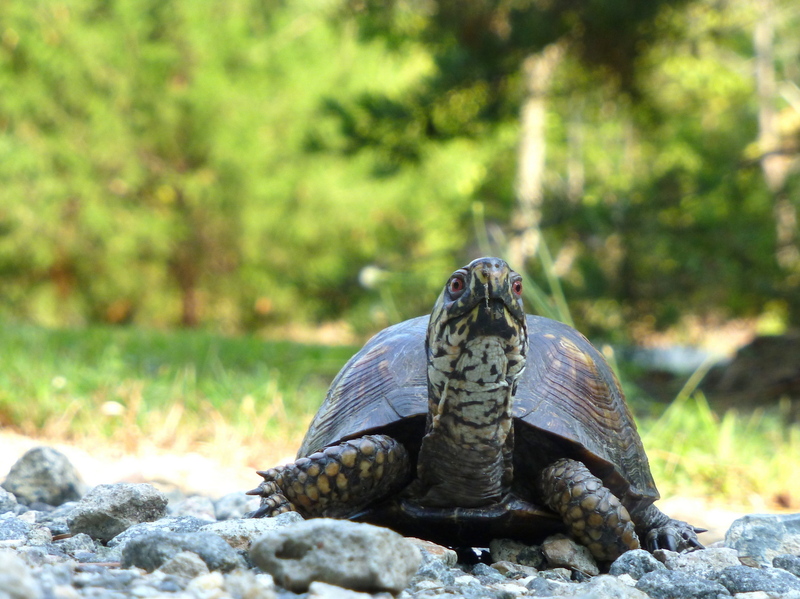 This week’s photo challenge was From Every Angle, and this box turtle obligingly gave me several angles to shoot from. 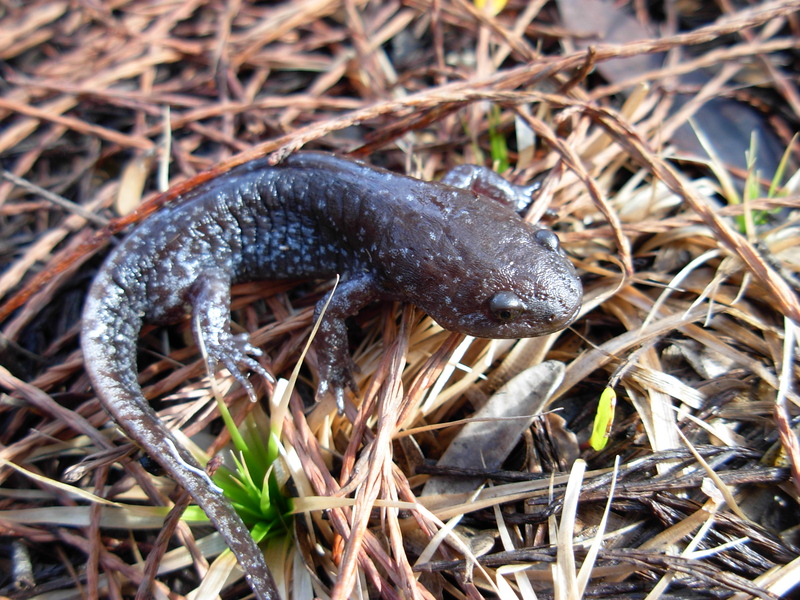 The mole salamander (Ambystoma talpoideum) is not a glamorous-looking creature. It’s small, unassuming, and slippery. It lives in burrows and in small isolated ponds in the woods. It’s mostly dark brown or black, often mottled with a gray or blue lichen-like pattern. It has a broad, flattened head. It looks a little like some artists’ reconstructions of Tiktaalik, and it’s easy to picture it living back when animals were first starting to crawl onto land. Many southerners will recognize the green anole, aka Carolina anole, aka American chameleon. 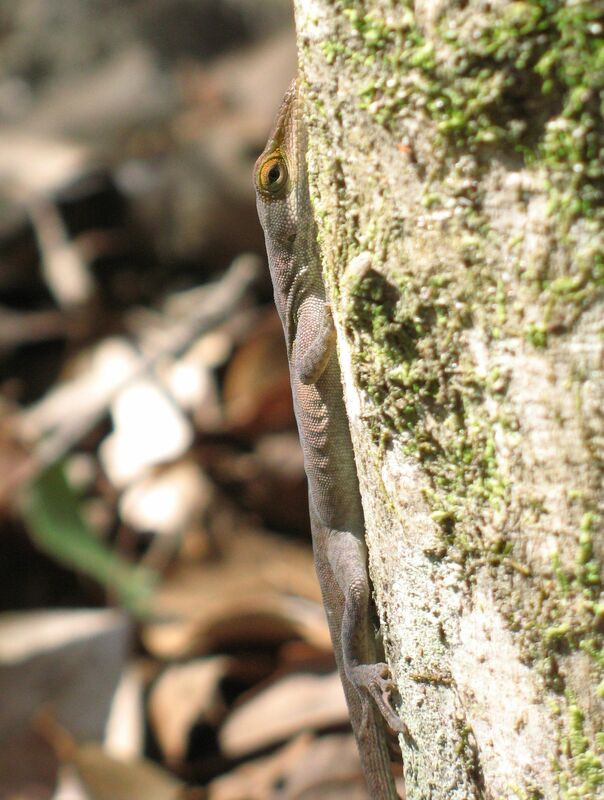 The scientific name is Anolis carolinensis. Though sold in pet shops as “chameleons” because of their color-changing ability, they’re not the same as the true chameleons of Africa and Asia. 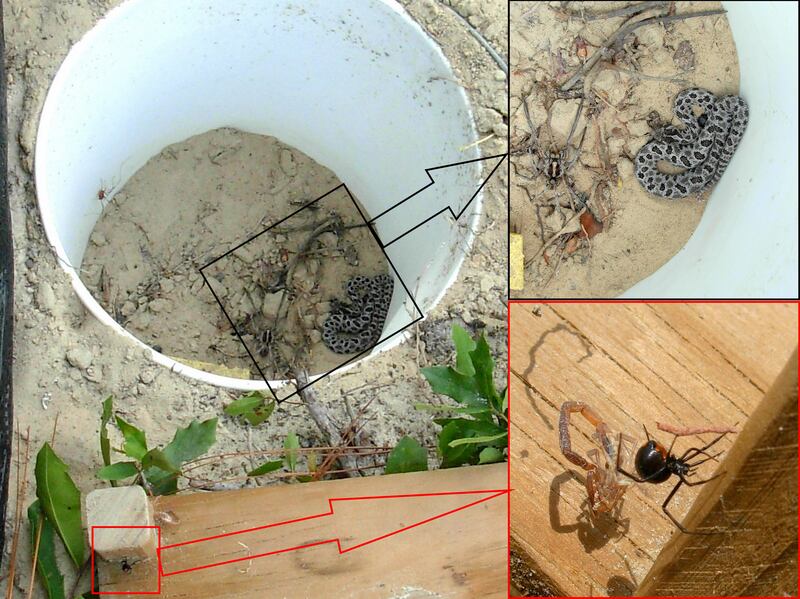 Pigmy rattlesnakes always look disgruntled, but this one has a really good reason! It blended in so well, and I was paying so little attention, that I didn’t see it until I was bringing my foot down. I didn’t have time to stop it. I stepped right on it, trying at the last instant not to put too much weight on it. Next thing I knew, I was standing about six feet away. I think I made an inarticulate squeak as I jumped away. The snake never tried to strike at me. It just coiled up tighter and glared. I took a quick photo and then I left it alone. Every stick and leaf looked like a snake for the rest of the day. 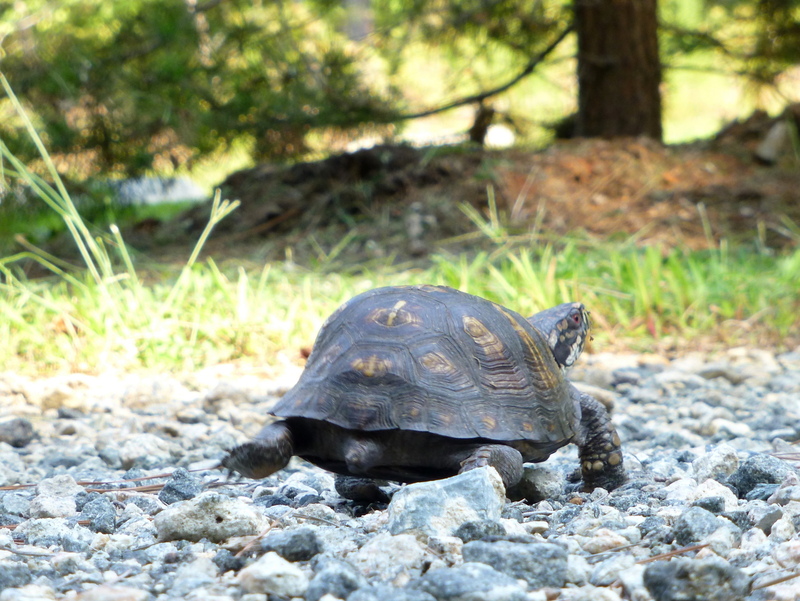 The gopher tortoise is large, as North American land turtles go, but it does not stand out. It’s slow-moving, grayish-tan, close to the ground, and when not moving it resembles a smooth, dome-shaped rock. On top of that, it spends a good part of its time underground. 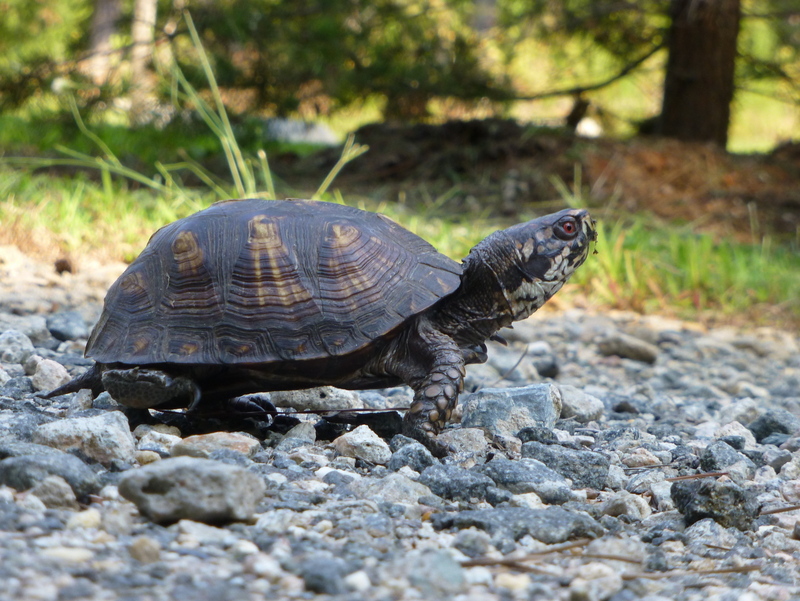 The tortoise is most visible when actively digging, as a fountain of sand flies up behind its claws. The burrow is easier to find than the tortoise itself. The burrow of a mature tortoise can be spotted from a long distance in the hot, sunny, sandy habitat it prefers. A tortoise burrow is a crescent-shaped hole in the ground, with a wide mound of sand called an apron in front. These burrows go all the way down to the water table, so they stay relatively cool and moist in summer, and relatively warm in winter. 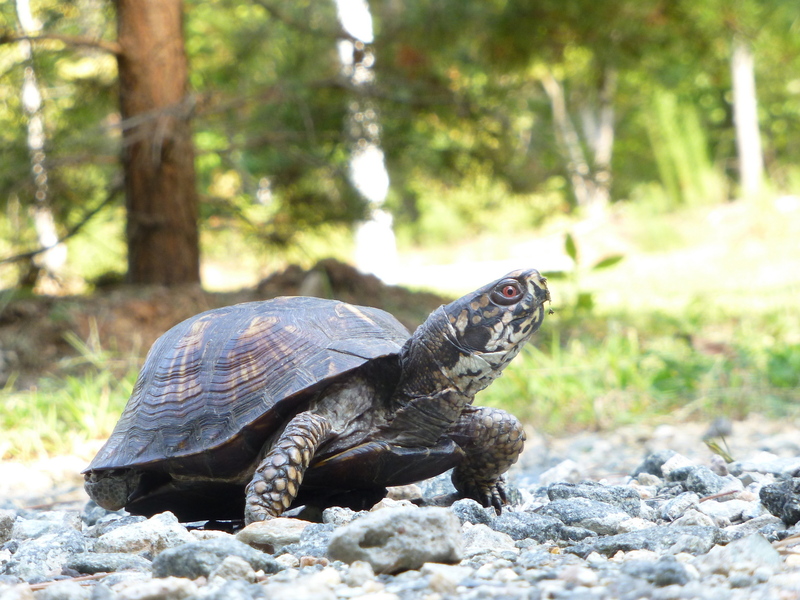 This makes them an ideal refuge for many other species, and the tortoise doesn’t seem to mind sharing. 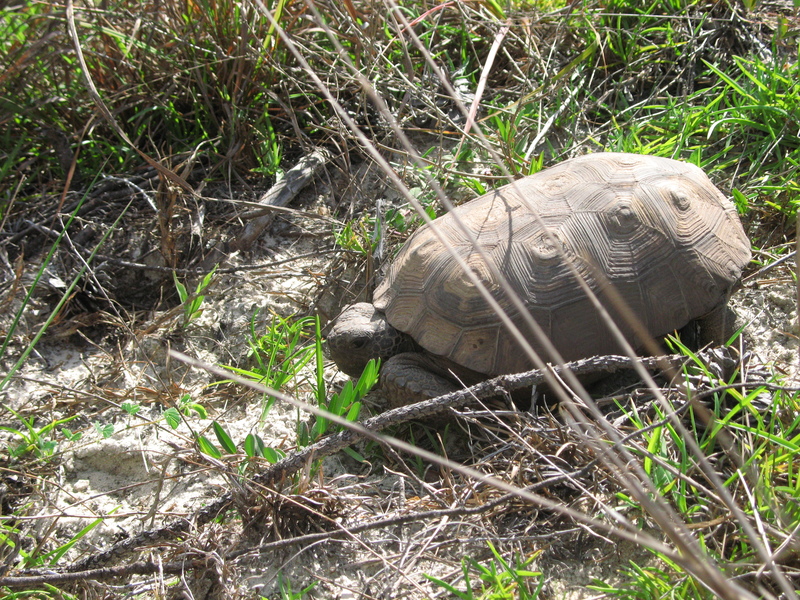 Over 350 species have been found in gopher tortoise burrows 1. Personally, I have seen frogs, snakes, mice, beetles, and once a skunk. Several years ago, I was working as a field biologist. I was out in the woods all summer and winter, trapping small amphibians and reptiles. It gave me an appreciation of the sheer diversity of animals hidden in the trees, underwater, underground, in any patch of grass. The places I worked were only a mile or so from suburban housing developments, yet most people I talked to, even the anglers and hunters and hikers, were unaware that many of these species even existed. And I did talk to a lot of people. It’s the sort of job people are curious about. If I happened to stop by the grocery store while wearing my work T-shirt, some random shopper would ask how to get my job. “Do you have to have a college degree?” I’d tell them that I did have a degree, but it was possible to get a job without one if you had relevant experience. They would begin to look hopeful. Then I would regretfully crush their dreams: I’d tell them how much it paid. They would look at me disbelievingly and tell me their nephew made that holding a STOP/SLOW sign for the road company. After a while I realized I was never going to pay off my student loans, so I left that job and went back to school to accumulate more. I’m now a graduate student, and I spend a lot less time in the woods these days. But one thing that happens when you walk around in the woods and look at things for a living is that you take a ton of pictures. Some of them even turn out well. A few months ago I was looking for a specific photo to show a friend, and ended up scrolling through the photos I took and thinking, hey, these aren’t bad. I should do something with them. 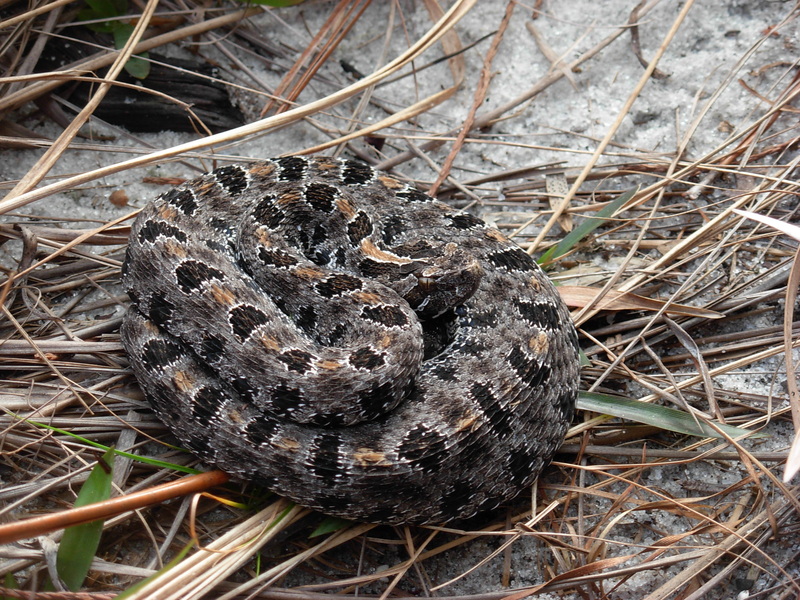 So this blog is for showing some of the hidden and lesser-known species of the southeast US: the burrowers, the swimmers, the creepers, the camouflaged, and the just plain overlooked.